Quilts of Love | A GRAND DESIGN – Kindle HDX Giveaway & “Fall into Fall” Facebook Party! Enter today by clicking one of the icons below. But hurry, the giveaway ends on September 16th. Winner will be announced on the Quilts of Love blog. Plus make sure you RSVP to the October 7th author chat party with Amber Stockton and Robin Caroll for an evening of book chat, quilting tips and tricks, prizes, and more! I really enjoyed this month's new Quilts of Love book, "A Grand Design," by Amber Stockton. Right away I was drawn into the story as Alyssa is a character whom is so easy to relate to and she became so real to me. Also, the storyline is so fun, imagine winning a bridal magazine contest when you aren't getting married, much less even having a boyfriend? Added to this is the fact that the vacation is to a place where Alyssa has family and a history. I really enjoyed "sharing" this vacation with Alyssa and Libby as these two best friends are so fun and complement each other so well, as they are so different from each other and balance each other out so well. Alyssa's story is shared throughout the book as well as her grandmother's, and it is shared in a way that kept me reading as different pieces were hinted at, but not revealed until later on. As Alyssa travels over the island getting the quilt pieces for her grandmother, she learns so much and also heals little by little. This is an excellent read, one that is quick, sweet and will capture your heart; I highly recommend it. Experience New Growth and Transformation in Your Spiritual Walk. Are you experiencing a hunger to know God more completely in your life? Do you long for a deeper connection with him? If so, then the NIV Spiritual Renewal Bible - the recipient of the 1999 ECPA Gold Medallion Award - is for you. Using a time-tested process honed over decades of counseling and teaching, Stephen Arterburn employs 7 core principles of spiritual renewal and refreshment, connecting you more closely with God’s Spirit through his Word and helping you to develop the deep, satisfying change you desire in your spiritual life. As soon as I saw this Bible and read the description for it, I knew that it was one that I needed. Life is busy, crazy and overwhelming at times and often we just need a rest, a time for renewal; this also includes needing a time for spiritual renewal. This is the focus of this new Bible and one that I am looking forward to working my way through. This is jam packed with devotionals and notes shared throughout meant to help the reader find that feeling of renewal in one's life. I have paged through this Bible and read a few of the devotions and essays shared and I am eager to really delve in and follow the reading plan. This is an excellent choice of a Bible for those whom are seeking to rejuvenate their spiritual journey. I just cannot say enough about Susan May Warren's Christiansen family series, I love the series and the family! I was so excited when I found out that Susan had written a Christmas novella and even more excited when I received it! Just look at this cover, how can you not fall in love with it!? And now that I have read it I am even more so looking forward to the next book in this series releasing in February! "Evergreen" focuses on John and Ingrid, the parents of the Christiansen children whom all of us readers have enjoyed getting to know in the first three books of this series. Now that all of the children have left home, John and Ingrid are empty nesters, but this is not a happy time for them. As John plans a surprise, things do not go as planned and blessings come in unexpected forms during this holiday season. I highly recommend this book; however if you have not read any or all of the books in this series so far, do not read this one yet - read these all in order, right away, as you are missing out on some wonderful fiction that really could be real-life as these characters come to life and deal with every day challenges. 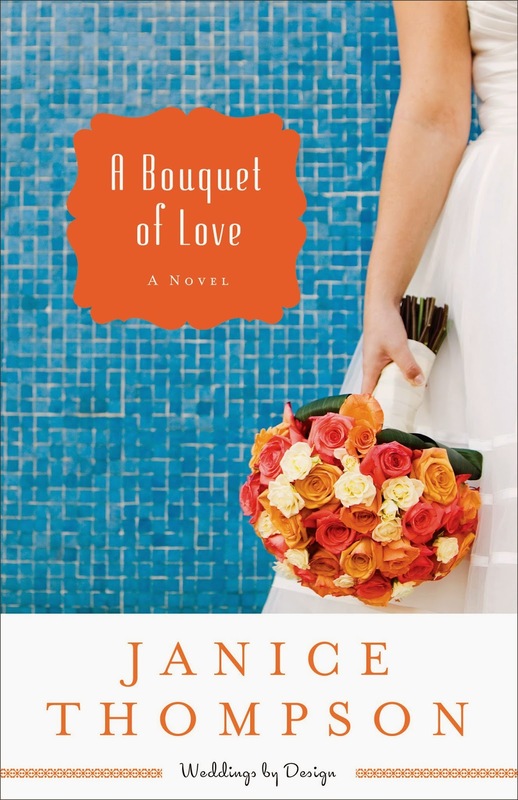 "A Bouquet of Love" is Janice Thompson's latest novel and number 4 in her Weddings by Design series. Janice has written another beautiful love story and has managed one again to include characters from her other books and series that allow the reader to be reminded of their stories, and also be "updated" on their lives. Cassia has recently moved to Galveston as her father decided he wanted to open another one of their Greek restaurants. This restaurant is in a prime location; however it is also across from Parma John's which is a popular Italian restaurant. Cassia's father, Babbas, forbids the family to eat at that restaurant or have anything to do with the family whom owns it. However, the entire family soon realizes that is impossible as it is run by the Rossi family and they have connections all throughout town and they are also a nice family whom they cannot help but like. Cassia is trying to live her own life and find her own niche which is working with flowers; however her father needs her help at the restaurant and she feels obligated to her family. With some guidance and friendships formed, Cassia will learn some important lessons, friends and love. I really enjoy Janice's books and always look forward to reading each one. I loved all of the connections throughout this book to her other books and am looking forward to her next book and hopefully spending more time with the Pappas family as there are so many more members of this family whom stories are "unfinished." I highly recommend this book for anyone wanting a quick and fun read filled with quirky characters and situations whom you are sure to connect with! "Firewall" is book 1 in DiAnn Mills FBI: Houston series and it is an exciting and captivating start! Taryn Young thinks she living the dream, she has married the man of her dreams after meeting and falling in love and marrying him in three short months. However, the morning they are to leave on her honeymoon, a bomb goes off at the airport while she is in the restroom before boarding her flight. When Taryn awakes in the hospital she learns that she is a suspect as her new husband whom the FBI believes is not whom Taryn believes him to be. What a start to this novel and believe the action and suspense does not let up! I did not want to stop reading this book until I reached the very end and with the twists and turns, I was kept guessing and my attention was held the entire time! I am looking forward to book 2 in this series! This is a must read for romantic suspense fans! Me Ra Koh's book is a wonderful resource for parents whom would like to capture everyday moments and special events with their families with their cameras. "Your Family in Pictures: the parents' guide to photographing holidays, family portraits, and everyday life" is filled with beautiful photographs, tips and suggestions for the reader to try in order to get the best picture they can with their cameras. The author shares her personal story and journey that has led her to this point in her life and to the creation of this book, it is very touching. Next she dives right into the basics that are needed for photographing and some tips to help each person be successful. Following this are sections devoted to types of photographs such as portraits and candids, and also different events parents want to capture such as holidays and "firsts." This book is filled with so many valuable tips and information as the author includes information as far as what settings to use on the camera in various situations and settings, but also tips as far as what the subjects are wearing and what else is in the picture and background. I love the beautiful photographs that are included throughout this book! This is an excellent book and I'm excited to try out these ideas in the upcoming holidays this fall and winter! About the book: Bold, sophisticated, and flirtatious, Army Air Force flight nurse Lt. Kay Jobson collects hearts wherever she flies, leaving men pining in airfields all across Europe. So how can ruggedly handsome C-47 pilot Lt. Roger Cooper be all but immune to her considerable charms? In fact, he seems to do everything he can to avoid her. I have been a huge fan of Sarah Sundin's novels since I read my very first one and I was so looking forward to her latest one, "In Perfect Time" and I was not disappointed in the least! "In Perfect Time" is book 3 in Sarah's Wings of the Nightingale series and focuses on Kay Jobson. Kay is a flight nurse whom is introduced in the previous novels in this series and she has been a really intriguing character, so intriguing that I was hoping that she would have a book devoted to telling her story. Kay is gorgeous, flirty and collects the hearts of men all around. However, she is hurting inside and hides herself beneath her "I have it all together" exterior. I loved the interactions between Kay and Roger as they are so different on the outside from each other, but inside they have so much in common. One of my favorite parts is near the beginning of the book when Roger gives his well-loved and well-read Bible to Kay to read. This was such a touching moment and really forged a connection between them. I really enjoyed this story and how Sarah brings history alive on the pages as well as drawing the reader into the characters' lives. I am looking forward to what Sarah writes next! 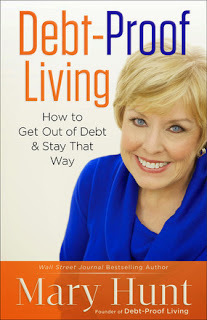 "Debt-Proof Living: how to get out of debt & stay that way," written by Mary Hunt, is a book that really can help you to change how you are living your life and feel more positive about your future. I was pleasantly surprised as to how much information is packed into this book! Mary addresses living following general guidelines in order to stay out of debt, but also addresses other and really every part of life. There is a section devoted to paying for schooling, owning a home, creating and following a spending plan and tracking your spending...and these are just some of the chapters included in this book! This book is written in a clear, straight-forward approach that holds the reader's attention, and is one that is easy to go back and reread specific sections as a little refresher. I highly recommend this book for those struggling and/or trying live debt-free.